I have seen Just crochet patterns before but always used free patterns so never bought. 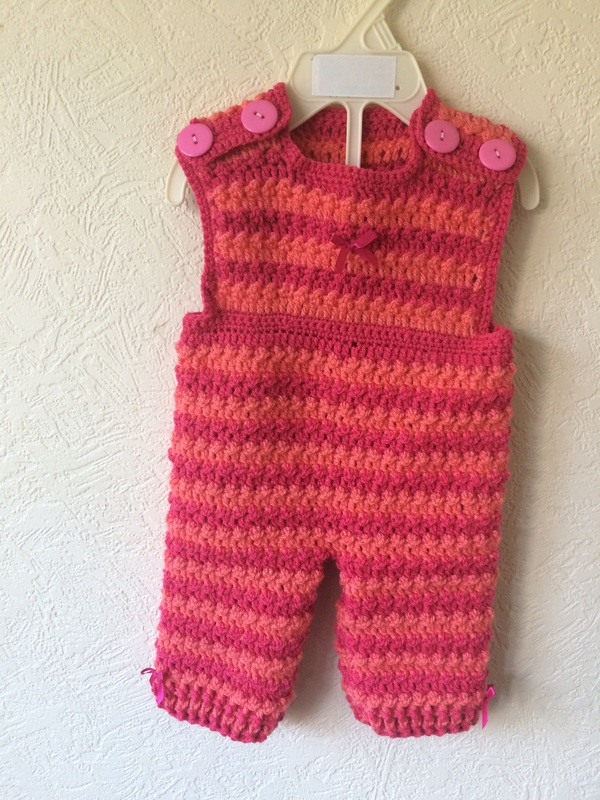 After wanting some cute dungarees that had a high back I came across a pattern on Just Crochet website. At £2.75 it’s a great price for 4 items. I’ve seen smaller items like hats or motifs for more than that. Just crochet provide you with the option to have the pattern in UK or USA terms which is great for someone who is used to USA terms but majority of english sites only provide UK terms and can get confusing for me. They also give the option to have this sent by post for 20p more. The pattern is lovely with a different look. I found some of the patterns when modelled looked a bit gappy and I wanted a more solid look that didn’t show the underneath clothes and skin when worn. It was slightly annoying needing to change colours so often but I remembered to keep it tidy tuck in my ends and the effect for me was worth it. The colours suited to stitch perfectly too and I don’t feel overwhelm the style. The dungarees are a fab fit too which adds to the solid look. They don’t need stretching over baby as have some room for comfort without looking baggy. I’ve not made the other items yet but I’m confident they will fit just as well. I made this over 3-4 nights mostly because of my speed rather than it being a difficult pattern. As I was changing colours I did both the legs at same time too which helped me speed the process up. It’s also so adaptable for either gender. Now for the down points which are just niggling points really everytime I clicked on anything besides the patterns it would open a new window. You end up with tons of browser windows open which is bit confusing at best of times. There was a severe lack of patterns in my opinion. Now there are a good amount on there but they are all specific to a size. Some bigger items I love but my doll is 0-3 month size and can’t make for her which disappoints me and I hate resizing crochet patterns so tend to avoid it and grumble instead. This isn’t so much a negative more I love all the patterns and want them all in 0-3 month size. Remember to save the PDF I didn’t and had to contact them to resend as the link expires after 2 days. You should save to a laptop then you can send it to other devices if needs be. I have a hudl which I store all my patterns on but it wouldn’t download so had to email it from my laptop instead. Although the pattern is good value and the dungarees worked out really well some parts confused me due to wording and I think at these points a picture would have saved me an hour. It explains to start at waist and do SC rows the way it was written I thought it meant down back seam but after doing that I realised it must mean along waist to create a waist band although wasn’t certain it seems to be right. I also at one point thought legs were done in ribbing stitch so a few more spacings, extra titles and one or two pictures would be great and make it easier for a beginner to do. Here is the result. I added bows to the front and the legs then since added roses to middle. 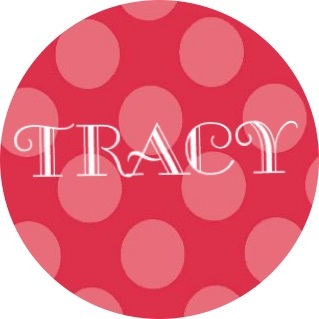 I accesorised with a cream baby gro, coral socks and cream shoes. I then popped on her rose headbanc which seemed to match the colours well. 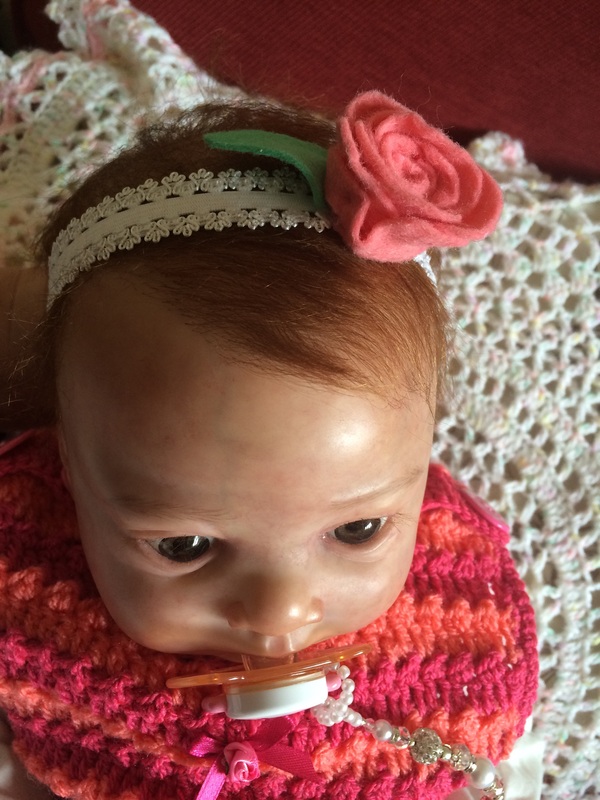 Want to make your own headband then click the picture to find the tutorial on our Dolly blog. You can also make matching barefoot sandals.